Giving the citya��s food obsessives a taste of the Chiu Chow culinary tradition, from the Chaoshan region of Guangdong province is chef Haiming Luo, who has flown in all the way from the Ritz Carlton, Shenzen. 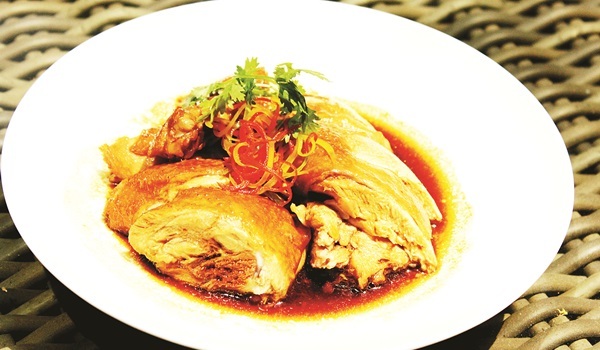 Bearing a mix of Fujian and Cantonese influences, Chiu Chow is said to be subtle on the palate, with a focus on clean flavours and fresh ingredients. a�?This comes from the Southern region of China, where a lot of importance is given to health. We believe that eating right has the power to heal,a�? begins chef Luo, as a tray of his hot and sour Szechuan style soup is served at the table a�� a warm bowl containing slivers of tofu, chicken, and shiitake mushroom in a fragrant broth.While the soup was a great start to the meal, it was the seafood and chicken taro spring roll that elevated it to a whole new level. Known for its health benefits, the root vegetable is mixed with minced shrimp and chicken and encased in a crispy parcel. The prawn har gau was also impressive, featuring meaty chunks of prawn and crunchy veggies, all held in a smooth and silky casing. The highlight was undoubtedly the baked barbeque pork bun, a nice mix of sweet, salty and meaty notes, that we couldna��t get enough of. The bun itself was as crisp as a freshly baked cookie on the outside, while being soft and chewy on the inside. Combine that with the perfectly turned out char siu and youa��re well on your way to food heaven. The spicy king prawn dish shines the spotlight on the protein, letting the meat speak for itself, with just a dash of garlic and green pepper. a�?The prawns are deep fried along with their shells,a�? explains the chef. We liked the delicious mix of crispy and soft textures, and the aromatic flavour from the garlic added to its appeal. For those who love their lamb, the braised lamb with garlic shoot must not be missed. The meat is braised with Chinese star anise, cinnamon and bay leaves and sauteed with garlic shoots. Cooked for over two hours, ours was melt-in-the-mouth sinful. After the protein heavy meal, a great way to cleanse your palate is opting for the Chinese herb tea jelly, which is served with honey and fruit. Just a drop of honey over the jelly brings out the aroma of the tea beautifully.